I have no one to blame but myself (a significant downside of being self-employed), and know I’m not going to get a lot of sympathy, but I just need to share how crazy my last few weeks have been. I’m in the final third of a stretch of three photo workshops in three time zones in three weeks, separated by a grand total of 20 hours at home. Today I’m in Bishop, California, for day-two of my Eastern Sierra workshop that started yesterday in Lone Pine (California) and wraps up Friday morning in Lee Vining (California). This marathon travel schedule kicked-off on Thursday, September 12, when I left Sacramento for my Hawaii Big Island workshop. I finished that workshop with a Kilauea night shoot on Friday the 19th; Saturday morning I was back to the Hilo airport for my flight home (plane change and layover in Honolulu), finally dragging in the front door about 11 p.m. Saturday night. At 8:00 a.m. Sunday morning my daughter deposited me back at the Sacramento airport for a flight to Salt Lake City, where I met Don Smith for the five-hour drive to Jackson Hole to help Don with his Grand Tetons workshop. Because the Hawaii/Wyoming weather conditions are so different, and my turnaround was so quick, I actually packed for the Teton before leaving for Hawaii (I’m so glad I did). After a week in the Tetons, we wrapped up that workshop with a wet sunrise shoot on Saturday morning—then it was straight to the Jackson airport for a series of flights and airport shuttle that got me home Saturday night. I had just enough time to upload my images, refresh my suitcase, catch five hours sleep, and pack the car before heading back out the door early Sunday morning for the six-hour drive to Lone Pine for my Eastern Sierra workshop. Am I tired? Probably, but I won’t feel it until my drive home on Friday. Am I complaining? Absolutely not. Not only did I do this to myself, how could anyone complain about three weeks filled with Hawaii, the Grand Tetons, and the Eastern Sierra? And honestly, you can’t really be happy doing what I do without at least being able to tolerate travel. This year, before my current marathon travel stretch, I’ve been to Death Valley, Yosemite (many times), Maui, Kauai, the Grand Canyon three times (including a raft trip), plus Page and Sedona. And truth be told, I enjoy driving, and don’t mind flying. Driving relaxes me, and flying is an opportunity to catch up on my reading and writing. Nevertheless, it will be nice to have consecutive days home, in my own bed,with the alarm off—before next month’s trip to the Columbia River Gorge…. Everyone knows about Hawaii, and most know about the Grand Tetons, but mention of the Eastern Sierra still elicits a blank stare from many people. That’s probably because most tourists haven’t discovered it yet (the photographers certainly have). With Mt. Whitney and the Alabama Hills (if you’ve ever seen a John Wayne, Gary Cooper, or John Ford western, you know the Alabama Hills), the bristlecone pines (in the White Mountains, across the Owens Valley from the Eastern Sierra), Mono Lake, Yosemite’s Tuolumne Meadows, and lots of fall color, it’s my most diverse photo workshop. We started yesterday evening with a nice shoot of the Whitney Portal waterfall, in the shadow of Mt. Whitney. This morning we photographed alpenglow on Mt. Whitney and the Sierra crest from Whitney Arch (aka, Mobius Arch) in the Alabama Hills. After breakfast we made the easy, scenic one hour drive to Bishop, which is where I am now (thank you, Starbucks). 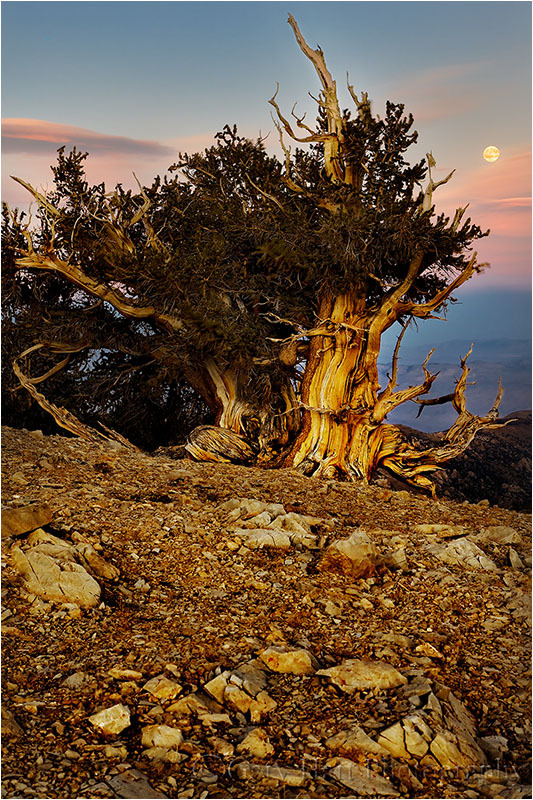 Tonight it’ll be the bristlecone pines, at more than 4,000 years, among the oldest living things on Earth (older even than Larry King!). For tonight’s bristlecone shoot I’ll take the workshop to the relatively accessible Schulman Grove. But when I’m on my own, I often continue thirteen unpaved miles to the Patriarch Grove. And that’s the trip I made a few years ago, because I thought the bristlecones would make a nice foreground for the rising full moon, and because the Patriarch Grove has a clearer view of the eastern horizon than the Schulman Grove. At the Patriarch Grove, finding the clear view I wanted required me to take off cross-country. Unfortunately, when I scaled the final ridge, I found the horizon obscured by clouds. Not to worry, the light was perfect for photographing these weather-worn, gnarled trees. I’m usually pretty good about catching the moon’s appearance, but because I’d written it off for this evening (shame on me), I failed to register that the clouds were breaking up. Which is why I was both surprised and pleased to find the moon’s glowing disk hovering just above the clouds a few minutes after sunset. I’d been wandering so much, and so focused on the nearby scene, that I hadn’t identified a particular tree for any potential moon shot (also shame on me). With very little time before the foreground/moon contrast became un-photographable, I felt quite fortunate to find this tree so quickly. A wide composition would have shrunk the moon to nearly invisible, so I stepped back as far as the terrain allowed so I could zoom closer and compress the separation (and enlarge the moon a little). With a vertical composition, I had to decide on rocks or sky, but it wasn’t hard to decide that foreground rocks were far more interesting than empty sky. Let’s see, what’s tomorrow? Wednesday. Lee Vining, here I come….